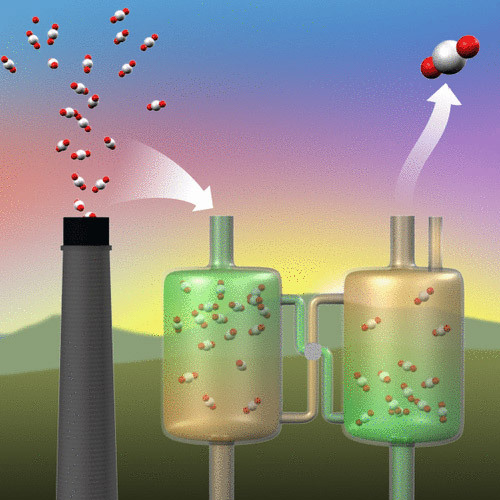 Pacific Northwest National Laboratory scientists presented new findings about their research into carbon capture. Image courtesy of Chemical Reviews; copyright 2017 American Chemical Society. A trio of scientists from the Department of Energy's Pacific Northwest National Laboratory presented new findings about their research on carbon capture Monday, dominating a session on the topic at the annual meeting of the American Chemical Society. Phillip Koech, David Heldebrant and Deepika Malhotra discussed their findings on a class of molecules designed to capture carbon dioxide emitted from power plants. The PNNL team recently overcame one formidable barrier to removing the gas from a plant's waste stream, reducing the viscosity of the carbon-removing materials by more than 90 percent. That means less energy would be needed to use the materials in a process where they absorb the gas, release it and then repeat the process — tiny molecular shuttles collecting the gas for potential use in oil recovery or the creation of plastics and other products. A key to the work was a collaboration with PNNL scientists Vanda Glezakou and Roger Rousseau, who pinpointed the precise molecular bond that was causing the experimental material to be so viscous. With that knowledge, the other scientists altered a single hydrogen bond, dramatically reducing the viscosity of the material — changing it from the consistency of honey to more like water. The material releases the gas it collects at a relatively low temperature of 60 degrees Celsius, and it regenerates at 100 degrees Celsius — both improvements over current technologies since lower temperatures translate to less energy necessary to perform reactions. Heldebrant and crew recently discussed the state of research around these materials, known as water-lean solvents, in a review in the journal Chemical Reviews.